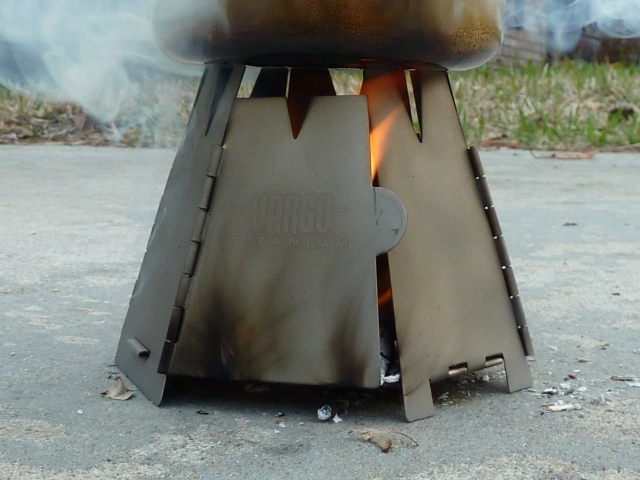 On a whim I decided to try out the Vargo Titanium Hex Wood Stove. I played with one at the recent First Annual Florida Hammock Hang but didn’t really get a chance to do much with it. I’d seen it before, though, and decided to pick one up when I found it a little cheaper than directly from Vargo. I purchased mine from Mt. Rogers Outfitters and received it very quickly. The stove comes with a nice embroidered nylon case. It’s hinged design allows it to fold flat for storage and it won’t take up much space at all in your pack. The official weight on the tag is 4.1 oz. On my scale it weighed 4.4. Without the case it was down to 3.0 oz. Certainly not a lot of weight either way you slice it. 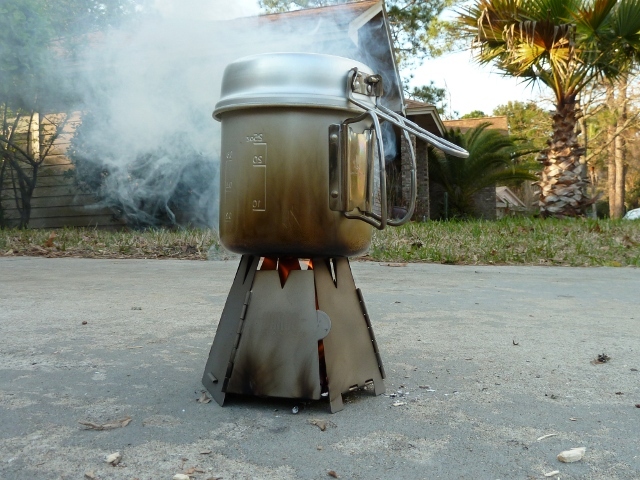 To assemble the stove simply unfold it and wrap the body sections around the base plate. 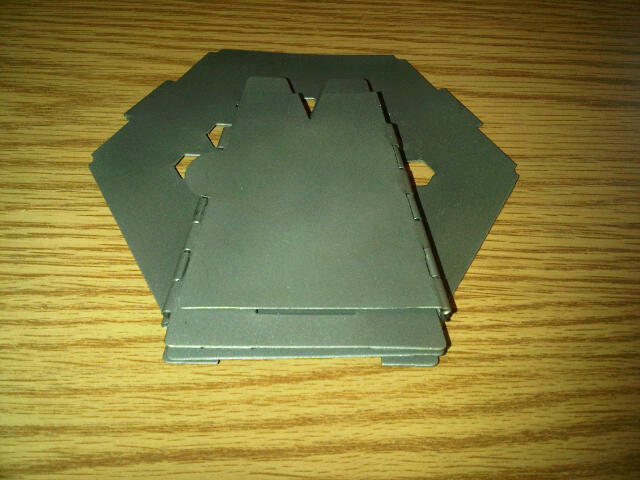 The base plate has two pieces that fit into slots on the body sections. The last body section is a door that can be opened for refueling or to allow more air flow. The base plate is elevated about 1/4″ and is perforated to allow for good air flow as well. I used a single dead philodendron leaf as my primary tinder bundle. My son helped me break up some small sticks (1/8″) and I worked on the larger pieces (up to about 1/2″). One thing to keep in mind is that you do need to keep your sticks small or they’ll have to stick out through the door. I got the stove lighted on the first try and everything caught quickly. It took much quicker than I’d expected to get a steady fire going. I set my Snow Peak Trek 900 on the stove and sat back for the boil. One thing I didn’t consider is coating my pot with soap to keep the fire from getting it dirty. By the end of the burn my pot was in serious need of some TLC. Since your sticks have to be so small to fit the stove it pretty much requires focused attention. I found myself having to blow on the fire to keep it going and to keep it hot enough. It took about 13:30 to get to what I’d describe as a low boil. It really didn’t qualify as a rolling boil but it was more than just a couple of bubbles. Even after 15 minutes I still didn’t have a full boil. However, it was more than enough to prepare water for any of the meals I eat. Cooking a meal on it might be a little more work than I’m ready for at the moment. I found that I ran it with the door open more than closed. I was afraid that the fire was going to go out and I wanted to keep a close eye on it so that I could stoke it if necessary. I will have to say that it’s a fun stove. I’d thought about it working as a portable fire pit for those backcountry trips where fires aren’t allowed but it might be more work than it’s worth. Once the water was boiling and removed from the stove it took about 30 min for the remaining wood to burn out and the stove to get cool to the touch. I’ll have to play with the stove some more before I decide if I want to try it on the trail. It’s certainly a functional stove, so I really don’t have any complaints. It’s pretty much exactly what I expected. There will be a video review posted as soon as I can edit the footage. I ran into similar issues as you, I had to blow on it to keep it going and make it hotter. I haven’t spent much time with it yet, but I’m coming from another wood stove. The other one keeps itself going without any help from me, except new wood. The Vargo seems to need me to blow on it, and doesn’t want to stay lit by itself. 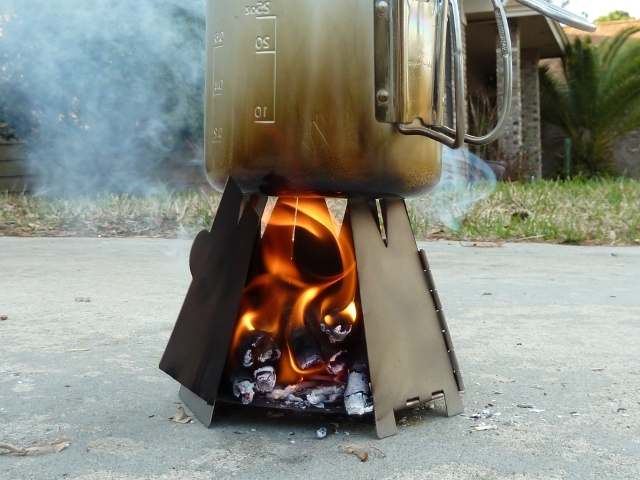 The other stove had a rolling boil in 12 minutes of my putting the pot on (after getting a stable fire). The Vargo was closer to 30 before I got there. I really dislike the other stove from an assembly/take down standpoint, but it works alright. I really want to like the Vargo, do you have any tips for getting the most out of it? The Vargo has, unfortunately, fallen out of favor. I’m using the Emberlit now instead which is what I assume you have as well. I don’t mind the assembly. I think its efficiency makes up for it. Like you I really wanted to like the Vargo but I think the design fails. It’s good in theory but not application. I am quite pleased with the original Emberlit (aside from the weight) and hope to get the Ti version soon. 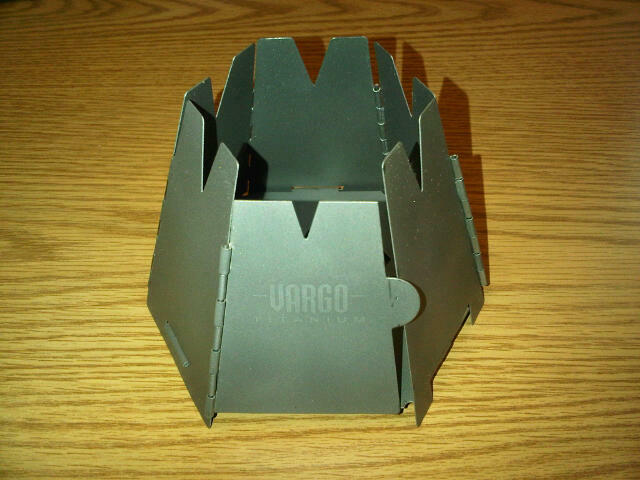 I use the Vargo Wood stove as a windshield to shield my Vargo alcohol burner, which fits inside perfectly.. I get a rolling boil at something like 10 to 15 minutes after the stove has primed depending on weather conditions. I usually use the alcohol but if wood is dry and I have the time I like to save fuel by using wood instead. It takes pretty long but I have found that one needs to establish skill with the Vargo Wood Stove. It takes some practice of getting the right amount of wood.. as with any hobo style stove..
I’m surprised that inside the Vargo you’re still taking 10-15 min to reach a rolling boil. I average about 7 min with my alcohol stoves with a simple windscreen. I haven’t given up completely on the Vargo and it’ll probably always have a home in my collection.